MediaTek, a creative micro-electronic design corporation, was planning on building its headquarters to incorporate global operation, research labs, design houses, conference and training facilities in a 3 hectare strip of land facing an 80 meter wide green belt] in northern Taiwan in 2004. The office as arranged considers the specific needs of “fabless” semiconductor business. The floor plans for two major functional groups, the offices of the headquarters, and the design houses are laid out with distinguishable planning features. 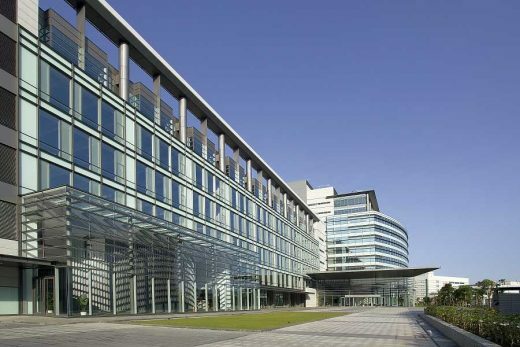 For design houses, the stepped building envelopes and alternated rooftop terraces are customized to accommodate the unique organization and working pattern of research labs. Its hand-shaped layout stretching towards the greenbelt maximizes views for each individual design lab without interrupting one another. For the headquarters, the curvilinear shape of glass curtain wall helps reduce the pressure facing the main street due to the tower’s massive volume. Comfort in the working environment is further improved through the introduction of ample natural light and greenery in the office. An innovative tensile structural system achieves a column-free dining hall with spectacular view through its 50 meter long glazed facade fronting the greenbelt. The auditorium is visualized as a second vantage point along the main street with its curved slatted wall inside a transparent enclosure. 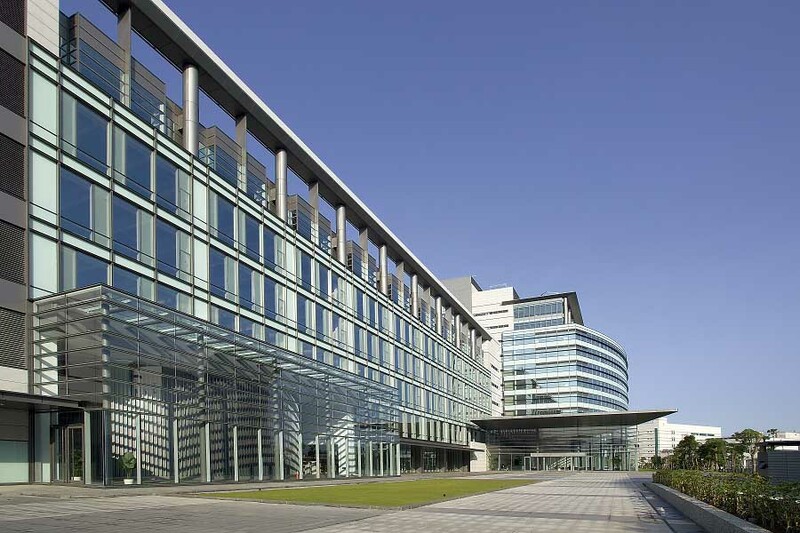 Main entrance of the building is oriented towards the south to countermeasure the strong north-eastern seasonal wind. The reception hall’s concaved metal roof echoes to the curvature of the headquarters’ curtain wall as a welcome gesture to celebrate the sense of arrival. The pavement alternates with green landscapes to help determine the diverse function of each different sector at the rectilinear entrance plaza. General Contractor: Fu Tsu Construction Co., Ltd. Structural Engineer: Team Engineering Consulting Ltd.
MEP Consultant: I. S. Lin Associates Consulting Engineers; Idee Engineering Consulting Co., Ltd. Lighting Consultant: Chroma33 Architectural Lighting Design Inc.